Bold Women’s Day, observed annually on the fourth Sunday of February, celebrates all Lutheran women who have acted or are acting boldly on their faith in Jesus Christ. Some women are bold in their unceasing prayers. Other women are bold in their service to those in need. Still other women are bold in their advocacy or through their hospitality. Whether we live out our bold story of faith in the workplace, family home or community, our faith compels us to make a difference in the lives of others. It’s all about living out our baptismal call, about being a disciple of Christ. 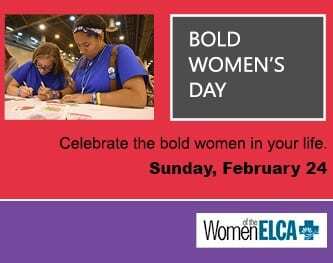 Download a liturgy to celebrate bold women.